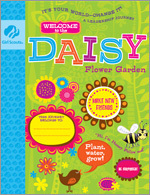 Welcome to the Daisy Flower Garden. In this journey for kindergarteners and first-graders, a favorite pastime - gardening - meets the Girl Scout Law. The result is a storybook world of flowers and little girls who, together, do great things! Girl Scout Daisies will especially enjoy meeting the colorful, global characters who teach them to live the Girl Scout Law. The Journey Book has 88 pages.